What Does Amazon’s HQ2 Mean for the Washington Region’s Economy? This is the first blog of two covering this report. In this post, we look at the economic and fiscal impacts of Amazon’s HQ2 on the region. In the second post, we examine the potential housing impacts related to HQ2. Amazon’s second headquarters (HQ2) is expected to bring up to 50,000 jobs and occupy 8 million square feet (SF) of office space in Arlington County, VA. The build-out is likely to occur over 20 years. The arrival of HQ2 in the Arlington County will have economic, fiscal and housing impacts on the County, the Washington region and the Commonwealth of Virginia. This report primarily focuses on the broader impacts on the Washington region. For a detailed analysis on the impacts on Arlington County, VA and the Commonwealth of Virginia, see The Economic and Fiscal Impacts of Locating Amazon’s HQ2 in Arlington County, Virginia. improving the Washington region’s economic brand, potentially improving the region’s ability to attract and retain talent. In addition to the economic impacts, HQ2 will result in significant net fiscal benefits to both Arlington County, VA and the Commonwealth of Virginia. For both the County and the Commonwealth, Amazon is expected to generate more new tax revenue than expenditures. Amazon’s HQ2 will further diversify the economy away from the federal government. The Washington region’s economy is currently shifting away from the federal government, a process that subdued economic growth in recent years. Amazon’s HQ2 would both continue and accelerate this shift, resulting in an improved mix of jobs and economic activities for the region. In 2010, nearly two-fifths (39.8%) of the Washington region’s economy was generated by the federal government. By 2017, this share had decreased to 31.2 percent (Figure 1). This economic shift has had two phases: a significant federal decrease in economic activity between 2010 and 2013, followed by improving non-federally dependent, private sector growth between 2013 and 2018. 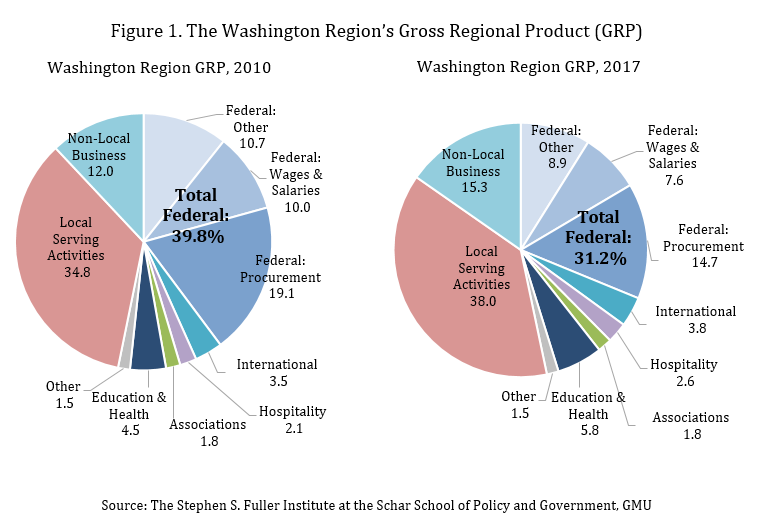 As a result of the federal declines, the Washington region’s economy, as measured by its Gross Regional Product (GRP), significantly underperformed relative to the national economy between 2012 and 2015 (Figure 2). This underperformance was most severe in 2013, reflecting the federal Sequester, and the draw-downs of the federal Stimulus and the conflicts in Iraq and Afghanistan. 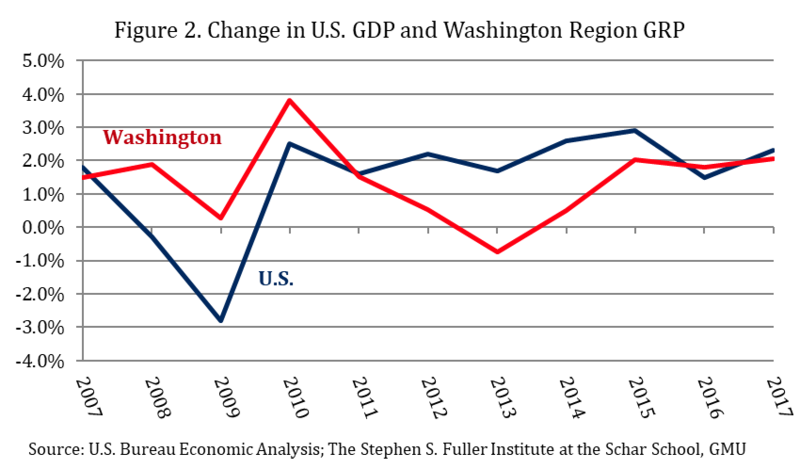 In 2013, the Washington region’s GRP decreased 0.8 percent after adjusting for inflation, marking the only year that the region’s economy decreased since 2000. The region’s changing economic structure can also be shown through the economic contribution (GRP) per job of those lost during the recession compared to those that have been added since. The average value to the economy (GRP) of each job lost during the recession was $173,166 while the average GRP value of each job added since the recession was $128,405, both in 2018-dollar value (Figure 3). In other words, the jobs lost during the recession had a larger economic impact per job than those gained during the recovery. The implications of this average value differential among the region’s old and new jobs are enormous. Most simply, it means that the regional economy has to generate 1.35 new jobs for each job it lost just to maintain the same level of economic activity, that is, to not experience economic decline. In order to sustain the economic growth achieved since the recession, the private sector has had to generate 2.4 jobs for each job lost during the recession. Losses in the government sector—the total GRP value of the federal jobs lost since 2010 was $5.1 billion and the total GRP value of the state and local government jobs added since 2010 was $3.2 billion resulting in a $1.8 billion net GRP loss—reduced the total contribution of these private sector job gains to the region’s GRP since 2010. 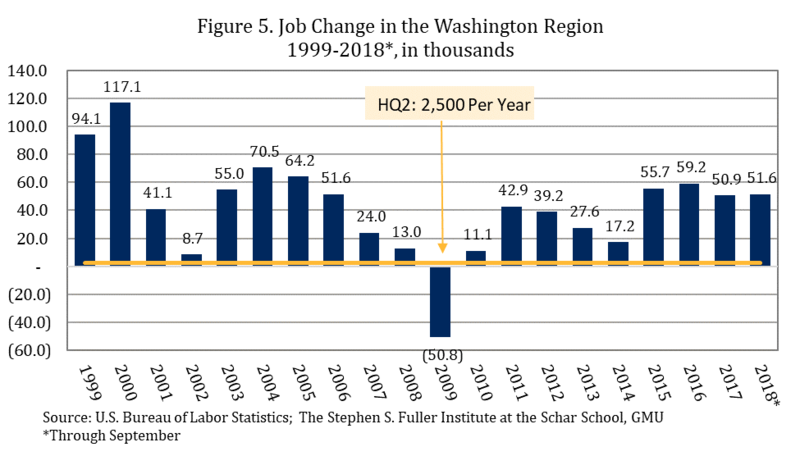 The key point here is that the Washington region’s economic performance has been shaped by the types of jobs it is generating and this pattern of job growth since 2010 has resulted in a slower economic growth rate than experienced in all of the nation’s other fifteen largest metropolitan areas over the 2010-2017 period. However, the Washington region’s relative economic performance improved between in recent years as the result of the mix of private sector jobs added during that period. The Washington region has seven advanced industrial clusters that are not dependent on the federal government, are in businesses that are export-based, are high-value added and are in sectors in which the region has a competitive advantage. Between 2015 and 2017, job growth in these clusters in the Washington region strengthened (Figure 4). 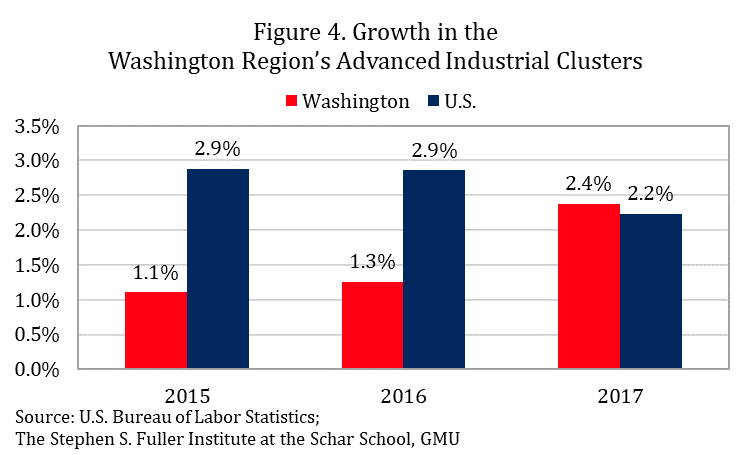 By 2017, the job growth in the advanced industrial clusters in the Washington region exceeded that in the nation, suggesting that the region’s private sector economy has begun to diversify away from the federal government, albeit slowly. The presence of HQ2 in the Washington region would continue this diversification, providing a better balance of economic activities and allowing for more consistent growth. HQ2 would only shift this overall economic composition of the region modestly, the region is a $530 billion economy as of 2017, but its addition would build upon, and accelerate, an existing trend that is beneficial to the region. Amazon’s HQ2 will bolster job growth for the region, but the gains are in line with historic norms. As planned, HQ2 would directly increase job growth in the Washington region and Arlington County, VA by up to 50,000 jobs over 20 years, or up to 2,500 jobs per year. Even with the job growth resulting from any additional spillover effects, job growth in both the region and the County has previously exceeded this amount and is projected to continue to do so. For the past three years, the Washington region added more than 50,000 jobs annually, and the region is on track to add another 51,600 jobs in 2018 (Figure 5). In the past 20 years, the Washington region added more than 866,000 net new jobs. In the next 20 years, IHS Markit forecasts a modestly smaller gain, 567,000 jobs, without the presence of HQ2. An additional 50,000 HQ2 jobs would increase that growth by about 8 percent, assuming HQ2 does not take the place of other gains and before accounting for any indirect or induced employment effects. 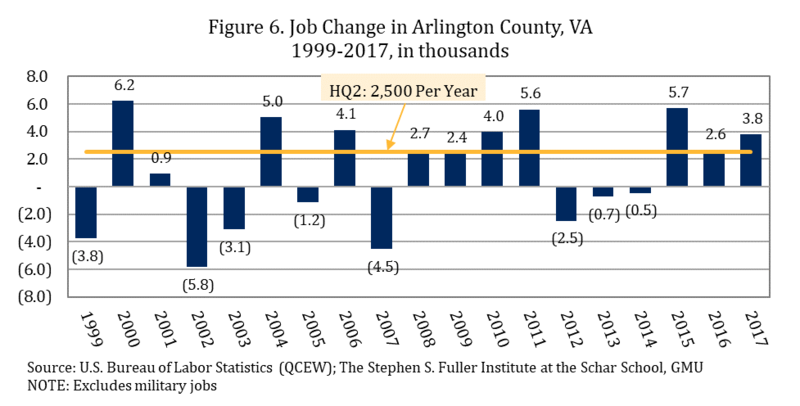 Similarly, historic job growth in Arlington County, VA suggests that the County can accommodate HQ2 (Figure 6). Between 1999 and 2017, the County added a total of 20,900 civilian jobs. This gain was in spite of the 2005 Base Realignment and Closure Act (BRAC) that resulted in an estimated 4.2 million SF of private sector office vacancy and the relocation of 17,000 Department of Defense (DoD) jobs (inclusive of military) out of the County, primarily in the Crystal City sub-market. In addition to the DoD, BRAC-directed relocations, many private sector DoD contractors also relocated from the County in order to stay near their DoD clients; the job loss due to the indirect effects of BRAC is harder to quantify. The County currently has about 4.6 million SF of private office space vacancy in the Crystal City/Pentagon City and in Rosslyn sub-markets, alone. Much of this vacancy is residual from the 2005 BRAC and had previously been occupied. Additionally, much of the vacant space is in older, Class B and C buildings that will likely need to be repositioned in the future to better accommodate the modern workforce. The arrival of HQ2 would reverse the employment losses that occurred from BRAC and provide a catalyst for the needed changes in the built-space environment. The Washington region has previously had, and will continue to have, job growth that exceeds what HQ2, alone, will bring. HQ2 will likely intensify this growth, especially within Arlington County, VA, but the knowledge that this growth is coming will allow for additional infrastructure investments to mitigate any adverse effects. Amazon’s HQ2 will generate additional economic impacts. The direct job growth and spending by HQ2 would also result in additional economic impacts to the County, Washington region and Commonwealth of Virginia. The impacts of locating Amazon’s HQ2 in Arlington County would accrue to the regional economy during construction and continue annually thereafter from outlays to support HQ2’s operations as well as from daily on-site spending by HQ2 workers for food and beverages, retail sales and transportation. These annual outlays related to the place-of-work of Amazon’s workforce would be complemented by these workers’ household spending within their jurisdictions of residence. As this new HQ2 employee and household spending circulates within the local economy, it would generate additional business transactions and support the payroll of local workers and workers located more broadly with this re-spending generating additional income and supporting additional employment within the economy. These economic effects can be measured using “multipliers” calculated by the U.S. Bureau of Economic Analysis. For Arlington County, VA, annual outlays associated with Amazon’s operations and workforce spending are estimated to slightly exceed $2.6 billion annually (in 2017 $s) contributing up to $3.4 billion to the County’s economy, reflecting a multiplier of 1.27. This annual spending would generate new personal earnings of $249.8 million that would accrue to workers residing in the County and represent County-based employment—full-time, year-round equivalent—ranging from 2,310 to 2,320 jobs. Additional jobs would be added in the Washington region and the Commonwealth of Virginia as a result of Amazon’s operations and workforce spending, including another 2,200 located in Northern Virginia. Amazon’s HQ2 will change the Washington Region’s unofficial brand. The Washington region has suffered as a result of its declining economic brand.The arrival of HQ2 has the potential to highlight the region’s highly educated workforce and non-federal attributes. More importantly, HQ2 would likely re-ignite the region’s ability to attract and retain talent. 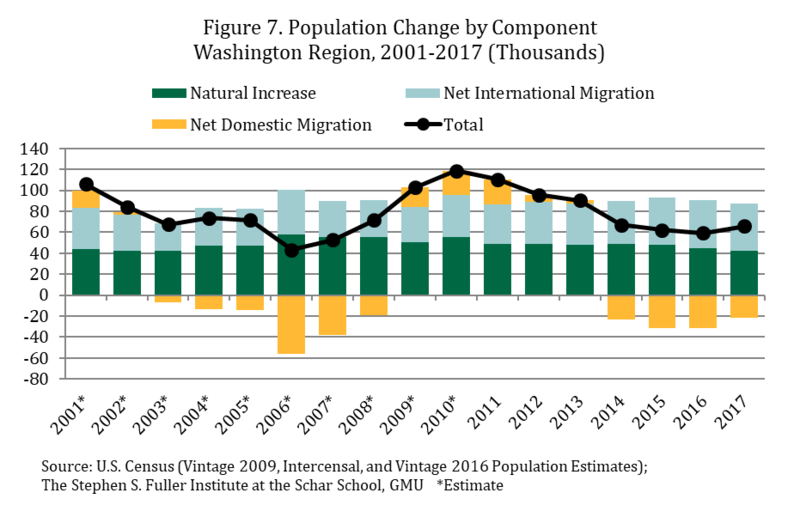 Since 2014, the Washington region has had net domestic out-migration and population growth has been driven entirely by the natural increase (births minus deaths) and net international migration (Figure 7). This pattern is typical when the national economy is improving and, in particular, when the economies of the metros with strong migration ties outperform the Washington region. In order to change this pattern, the Washington region needs to provide new opportunities to its residents, as the net domestic out-migration is typically the result of increased gross out-migration (instead of lagging gross in-migration). In recent years, the Washington region has not been able to attract and retain its younger workforce as well as it has in the past. The region has not attracted the oldest millennials at the same rates as it has for other generations. And, the region had a decrease in the number of 25-34 year olds living in the region in both 2015 and 2016, despite increases in this age group nationally. People are most likely to move while in their 20s and 30s, so it would be unlikely that future gains from older adults will counterbalance this attrition, barring a structural change. HQ2 has the potential to make the Washington region more attractive to current and future workers both by providing additional opportunities and by changing the region’s reputation and overall brand. The fiscal impacts on Arlington County of locating and operating Amazon’s HQ2 in the County with up to 50,000 on-site employees and the new residents that would be attracted to live in the County, including indirect and induced employment resulting from this new spending and additional households locating in Arlington to support this new economic activity, would generate a net fiscal benefit to the County. These fiscal benefits for the base-case at full build-out would total $52.3 to $52.8 million (in current 2017 $s), if the average HQ2 wage is between $150,000 and $200,000. These represent the returns, revenues over expenditures, that would have been generated for Arlington County had HQ2 been in place and built-out in Arlington County in its FY 2017 budget year. The fiscal benefits accruing to the Commonwealth of Virginia from locating Amazon’s HQ2 in Arlington County, comparing only the potential increases in individual income tax and sales and use tax revenues generated by the salaries associated with the new direct, indirect and induced jobs created within the Commonwealth and several sources of business-related tax revenues (corporate, sales and use, construction-related) with the required contributions to the local jurisdictions where the HQ2 and related new workers would reside for the additional K-12 enrollment generated by these new households, would result in a net fiscal benefit to the Commonwealth. These net annual fiscal benefits of these new direct, indirect and induced jobs and related new State residents would range between $328.6 million and $471.9 million at build-out (in 2017$s) under the current budget allocations. For the full fiscal impact analysis see The Economic and Fiscal Impacts of Locating Amazon’s HQ2 in Arlington County, Virginia; the executive summary is also available on the blog.